As an Italian American chick I have hair. I have it in places I wish I didn't and since my natural hair is a dark brown it shows up easily. When I was younger I used to get my eyebrows waxed but I never loved the look. It always seemed so harsh to me. Not the feeling of the waxing but the brows afterward. Now I wish that was all I had to wax. There is the stash, the chin hairs and the upper neck ones and they all creep out overnight. NOT FAIR....so not only will I have to worry about wrinkles and gray hair as I enter into my 50s next year, now I have to worry about having more 5 o'clock shadow then a lot of the men I encounter on a day to day basis! Usually I get good tweezers and sit in natural light with a really good mirror and tweeze, tweeze and tweeze some more. I have even handed it off occasionally to my 10 year old daughter to make sure mommy is hair free below her eye line level. I lie on the couch with my chin all the way up asking, "any hairs?" She has only had to tweeze one or two over the past month. She thinks it is funny. I quickly remind her this is her future. Well, a mother should prepare their children for the harsh realities of life no?! 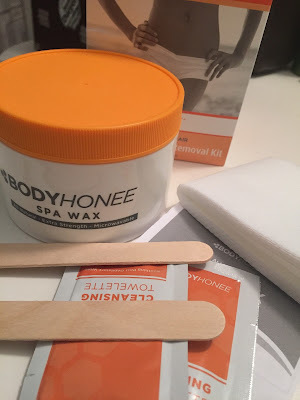 BodyHonee’s all-natural Sugar Wax kit is made with pure cane sugar, sea salt, and lemon juice. 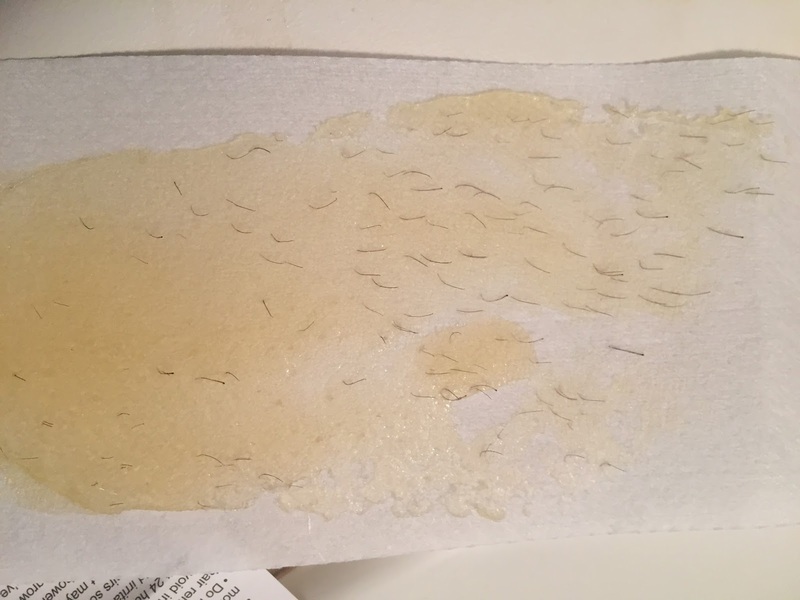 It is the perfect hair removal wax system for both men and women with fine to medium hair thickness. With ingredients so safe you can eat them, and results as effective as going to a salon – it is the ideal home waxing kit for a healthy, natural lifestyle. Using the kit is easy, simply apply a thin layer of BodyHonee wax onto you skin in the same direction as hair growth, apply your epilating strip over the wax and smooth down firmly 3-5 times, then in one quick motion, remove the strip in the opposite direction of hair growth. After you’re done waxing, simply wash any remaining residue off with water! It’s that easy. 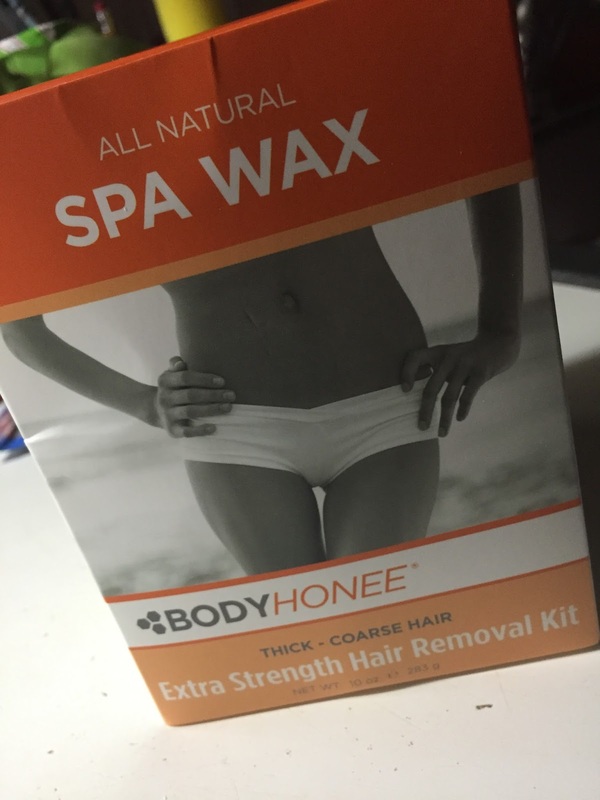 BodyHonee’s Sugar Wax is the preferred wax kit among men, but works just as great on women with fine to medium hair. Remain hair free for up to 8 weeks! 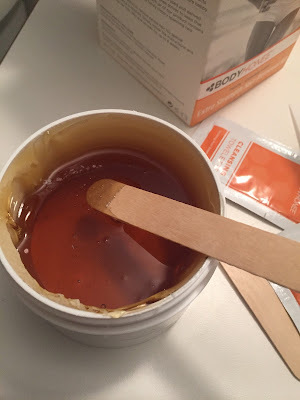 I used the wax on Saturday! When I opened the top I was concerned because the directions say to remove the top and the seal over the wax. The top was no problem but the seal impossible. It was completely attached to the wax and I was unsure if I could put the seal in the microwave. It was fine. 8 seconds in the microwave and I removed the seal. After that I stirred it with the wooden spatulas and put a sample on my wrist to make sure it wasn't too hot. It was fine so I proceed with my forearm. It was the place I figured I could see easily and control the amount of pressure. I smeared some wax on it, put a strip on, took a deep breath and ripped it off. Pain yes. If you have been waxed you know there is this moment when you think OK here it goes. Then you pull or the person waxing you pulls and it doesn't really hurt as much as you think it will. It stings YES. But not that bad. I moved onto the top of my hand where there isn't much but since I already had a paper and wax ready I proceed. Not bad AND it definitely made my arm smooth and hair free. Why not move onto my legs? I did...my legs are so smooth. I could never get that kind of smooth with shaving. Today, for review purposes I decided to to my knees. I tried to open the jar and could not. Not even a little. I ran it under hot water and tried again. NOPE! I ran it under hot water for a second time and wah-la...it opened. SO I suggest you always really clean the top of the jar and place it upright unlike me who closed it and tossed the box under the sink. Applying the wax again I concentrated on my knees. Apply the wax, put the paper over it. Run your hand or finger over the paper two times and pull against the hair growth. I think it would remove even if you went with the hair growth but I followed directions. The hardest part of ripping that piece of paper off your skin is just before you pull. You are so sure it will be excruciating. It isn't! Hurts yes but oddly enough, I don't mind it. It is truly amazing how easily the hair comes out. Takes way less time then when you shave or tweeze and the area is so smooth!!! I will be buying this again in the future with extra paper kits so I don't have to worry about running out. Disclaimer: I received a complimentary product for my honest opinion.